The adorable bunting was made via this lovely kit by Team Kitten, available for purchase and download at Kitschy Digitals. This holiday season has been especially rich in matryoshka motifs, I have noticed. Have you been to World Market lately? 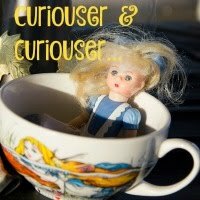 Have you seen this cookie jar? These measuring cups? These gift bags? These ornaments? Or these? 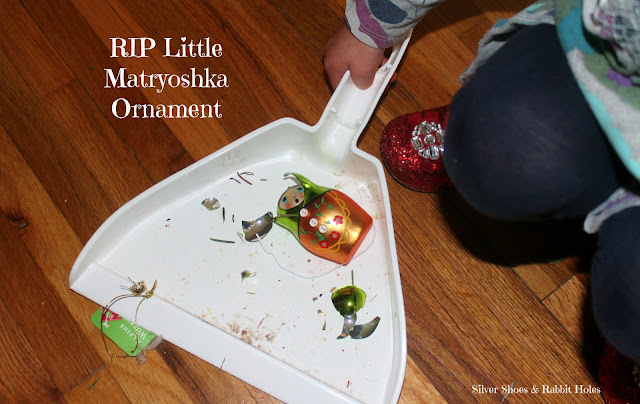 And now, a moment of silence for my little glass matryoshka ornament, who was killed when she fell from the height of a branch as she was being hung on the tree. 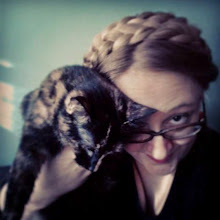 Farewell, sweet girl. We never had a chance to know thee. The girls attempted to name them. I think we have an Anya, a Katya, a Karina, and a Masha, but I could be wrong. Of course, I would love a collection of the real thing. I would love to visit Russia someday. I love Dostoevsky and Chekhov and ballet and onion domes and Orthodox icons... and et cetera, et cetera. There are a few fabulous sites out there for the real thing. 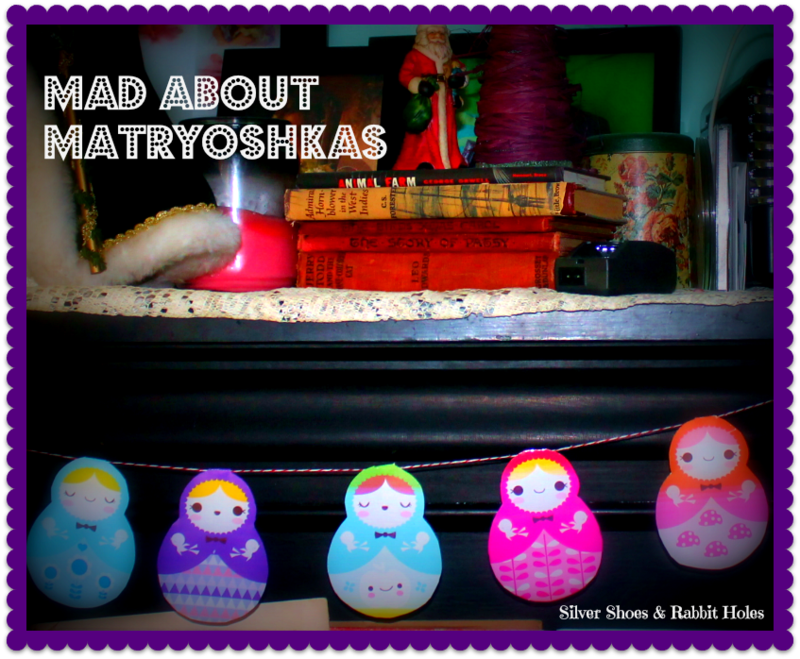 For cheap, kitschy and modern, check out Matryoshka Madness. (Many of their nesting dolls can be purchased on Amazon.) You can also find a large assortment at the Golden Cockerel, a company based out of North Carolina and St. Petersburg, Russia. There is also a site called Russian Crafts, based solely in St. Petersburg, that has a huge selection of matryoshka dolls, as well as a brief history. 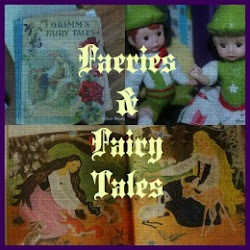 And last, let me share a couple of our recent library finds! 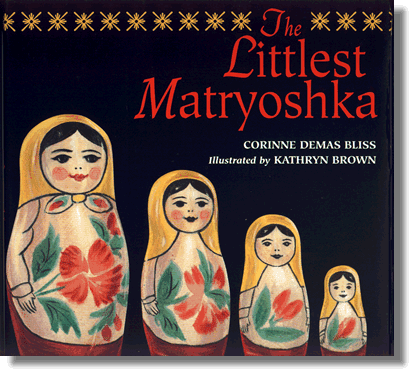 The Littlest Matryoshka by Corinne Demas Bliss, illustrated by Kathryn Brown. Hyperion, 1999. 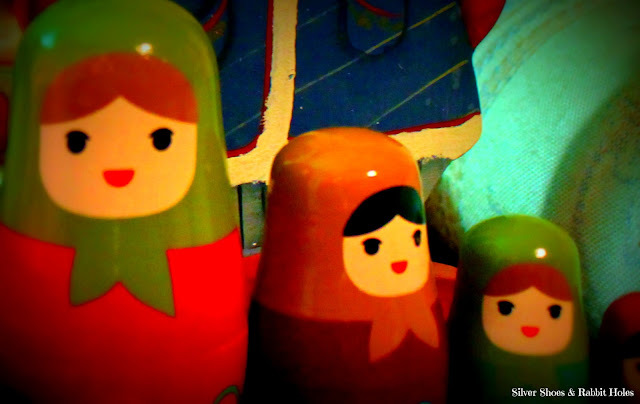 This is a sweet story of a set of matryoshka dolls, a set of 6, made in Russia then imported to a shop overseas. The toy shop owner lines them up on a shelf, but the littlest is knocked off the shelf, out the door, and buried in the snow. 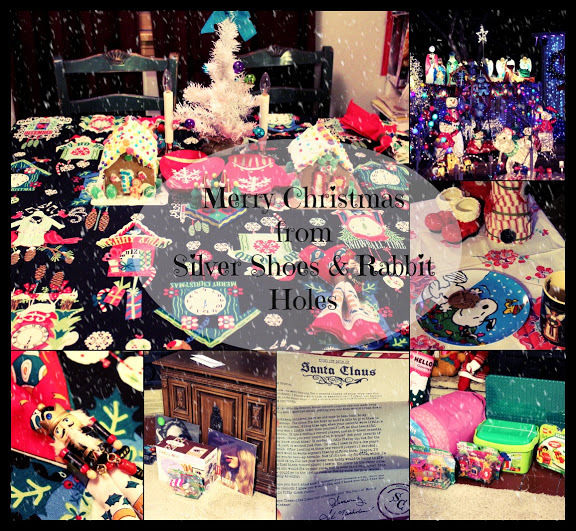 A little girl buys the set anyway, and the littlest doll begins a long journey, as her sisters stand watch. 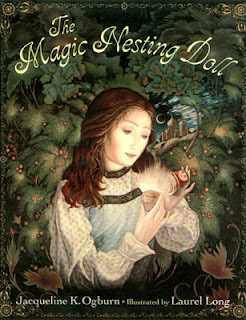 The Magic Nesting Doll by Jacqueline K. Ogburn, illustrated by Laurel Long. Dial Books for Young Readers, 2000. This book is just magical. It is a modern fairy tale about a girl who must make her way in the world, with only the magic nesting doll her grandmother gave to her. The doll may only be opened three times, and only when one has the greatest need. Katya sets out with her doll, only to find out about a sleeping prince who lies frozen like living ice. It is a reverse Sleeping Beauty story, with the heroine rescuing the prince, and herself, by using her magic nesting doll when the need is the greatest. The illustrations on this one are SPECTACULAR. I FLIPPING LOVE IT ALL!!! A secret: I don't think I've ever been inside an Anthropologie before. 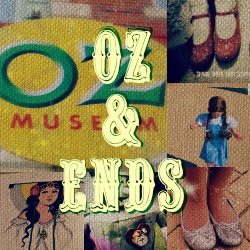 There is one at the Country Club Plaza in Kansas City, and I wanted to go there last time I was in KC, but I didn't find it. I have never been in an Ikea store, either. The closest one is in Dallas, TX, 7 hours away. One is being built in the KC area though, so that would make it a shorter drive. Sometimes I feel so DEPRIVED!!!! I'm so sorry about your ornament! At least you memorialized it with a picture! 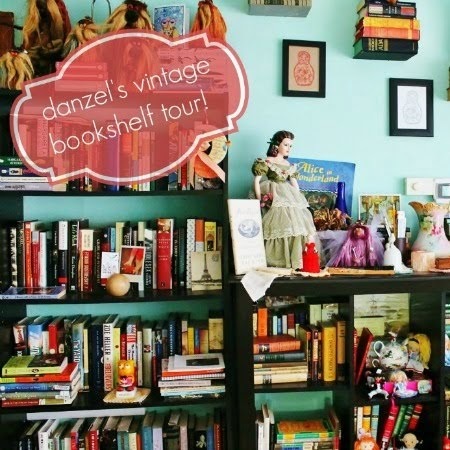 And those books look so fun. This post reminds me that I have a Matryoshka doll from my childhood...I must ask my mom where it is! The books are great! They are both very different, but the illustrations in both are wonderful. And thanks about the ornament! I want to go get another one, but for now, we have the wool felt one in the Advent calendar. At least she can't break! What a great post! I love that Sesame St. clip so much - watching the Old School dvd's is so fun. I know! I saw Volume 3 at a store the other day. Oh, I want it! And they had the weird Sesame Street Christmas special that was made the same year as Christmas Eve on Sesame Street. (I LOVE Christmas Eve on Sesame Street sooooo much! "And if that isn't a true blue miracle, I don't know what one is...") Anyway, this special was aired in prime time and had all these celebrity guest stars. A young 'fro-ed Michael Jackson is on the dvd case. I've heard it's pretty terrible, but of course, I want it anyway. 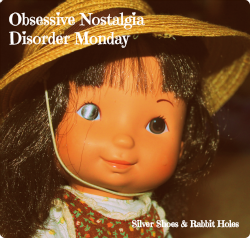 I love those dolls, too! I have a set that my mom got me as a child and I bought the felted wool ornament from target this year! 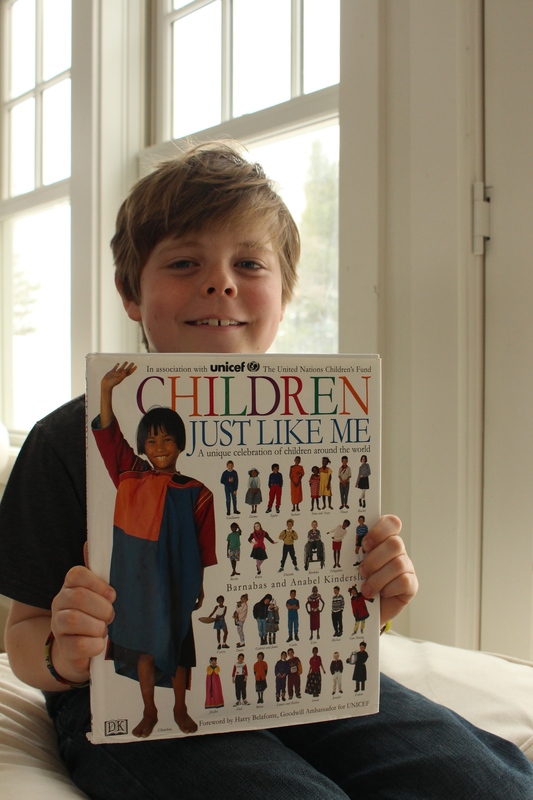 So glad you have one, too!